Yeah yeah.. PSL is everywhere, but Fall also means warm, comforting, big bowls of soup! With warm afternoons, and chilly evenings, Fall is the perfect time to make warm soups. I like to keep my soups light during this transition time thou. 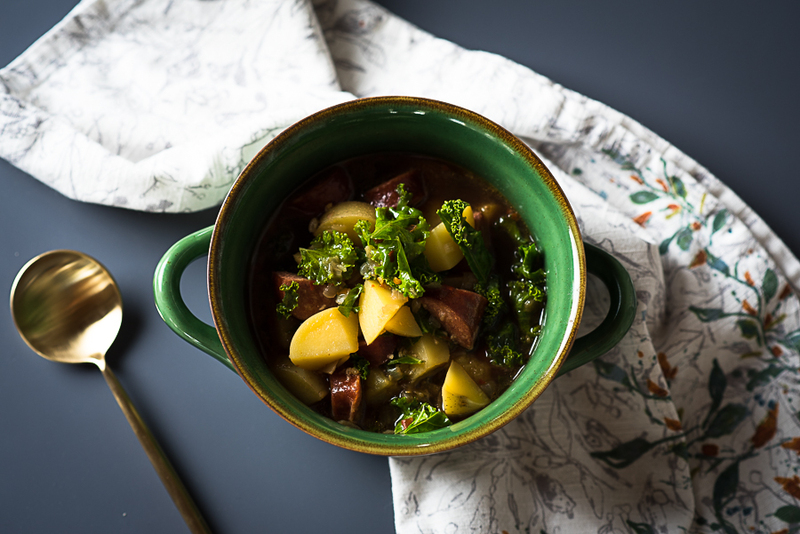 It’s not quit cold enough to make the heavy stews of winter, but chilly enough to crave a warm bowl of something. Start with a good homemade bone broth. I’ll be doing a post soon on how I make mine. I make a batch about every two weeks from the whole chickens I roast. It really makes all the difference in the taste and also is very good for you… ladies I’m talking to you! Extra collagen to help with your hair and nails, I’m so there! Kale… you either love it or hate it. I happen to love it and use it all the time in dishes! Dark leafy greens, also good for the body. Next we have to have meat. I use Linguica from Carlton Farms. They are my favorite meat shop and I live close to them, lucky me :) You could use any kind of sausage in this soup. Also I added some potatoes to round out the soup to a filling meal. Ever since the hubs and I did a round of Whole 30 last spring, we have incorporated that way of eating about 80% of the time. And he loves that he gets more meat and potatoes than ever before! 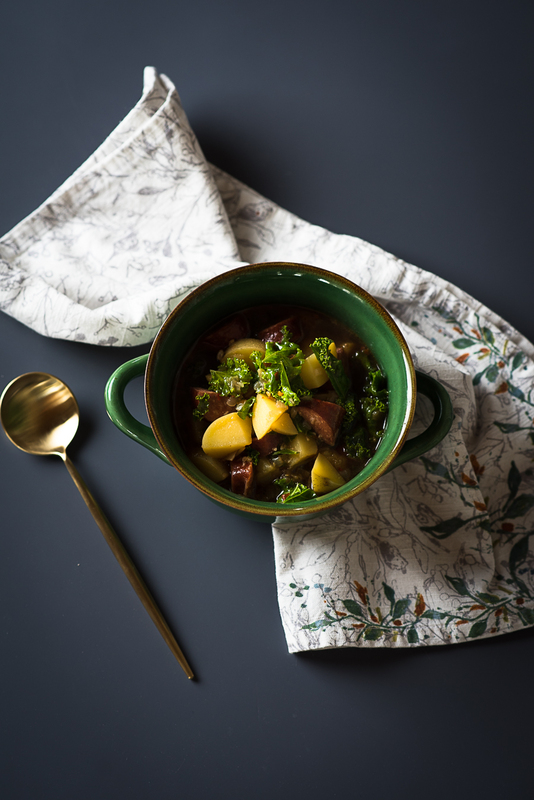 This soup is super easy and fast to put together too, making it a healthy option for a weeknight dinner. I always make a big pot so we have leftovers for lunch the next day. dash of red pepper flake for spiciness! In a large dutch oven or stock pot, add some olive oil and turn heat up to medium. When pot is hot, add the onion and saute for a few minutes until lightly brown. Next add the sausage and cook until browned. Then add the garlic for about 30 seconds. Next add the broth to the pot and bring to a boil. Once boiling add the potatoes and cook for about 10 minutes on medium high. 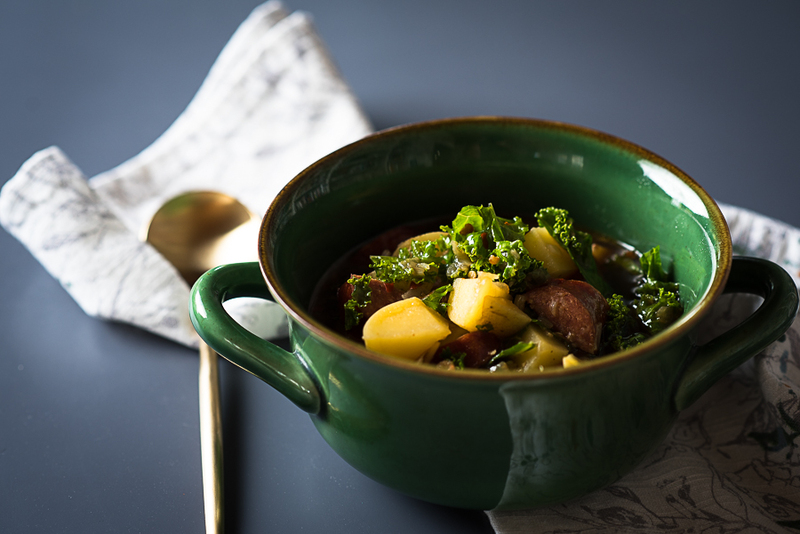 When potatoes are tender, add the kale and cook for about 1-2 minutes until wilted. Season with salt, pepper and red pepper flakes. Soup is ready to serve! Makes about 4-6 servings, depending on how hungry you are! Hey Tif, Tif, Can’t wait to make this soup. So excited for another recipe with Kale in it. Don’t know if you remember Harry spoiling us with all that Kale and swiss chard he brought in from his garden. Good old days! Hope all is well with you and the family. Sure miss you!